It’s wonderful in a whirlwindy sort of way when things you’ve been working on for a couple of months all come to fruition on the same day. To that end! I wrote an essay on Peter Jackson’s Hobbit films for issue 3 of Uncanny Magazine, which is now available online for free in its entirety. You are cordially invited to vent your spleen about the films with me, and/or nod sagely at your decision not to see them. But today is also the release day for Episode 3B of Uncanny’s podcast, in which I read M Sereno‘s utterly gorgeous poem “The Eaters.” It was the most delicious (ha!) challenge to read, because it’s a bilingual poem and to my sorrow I don’t speak Tagalog, but Sereno was kind enough to provide an audio pronunciation guide, and learning the sound and shape and cadence of the words as best I could was incredible. I found that until I was correctly reading the Tagalog words into the rhythm of the poem, I’d only been hearing half of it. I genuinely hope I did it something like justice, because I love that poem completely, and the experience of inhabiting and being threaded through with unfamiliar words (that nevertheless felt familiar in where they struck my throat, those deep qafs and glottal stops so like Arabic to me) was a gift. The episode also contains CSE Cooney’s reading of Sarah Pinsker’s “When the Circus Lights Down,” which I’m very much looking forward to, and an interview with Pinsker conducted by the fabulously Dangerous Deb Stanish. 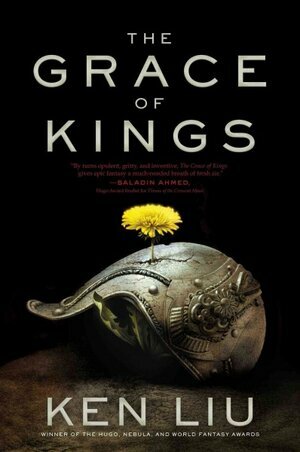 Finally, my review of Ken Liu’s breath-taking The Grace of Kings is live at NPR Books today. Liu’s world is beautiful, nuanced, fierce, original, and diverse; it’s refreshing to read door-stopper fantasy where the geographies and cultures aren’t Europe-with-more-apostrophes. But neither does this feel like alt-China: it reads much more like a world invented than transposed, and the warring states of Dara draw on a multitude of influences and references without being reductive fantasy-world allegories of any of them. I highly recommend following the review up with Liu’s Big Idea post about the book’s composition over on John Scalzi’s blog. I was fascinated to see where my reading had dovetailed with Liu’s intention and where I’d missed certain contexts or experienced the book differently. And that’s it for today! What are you all reading, writing, up to? This entry was posted in Uncategorized and tagged ken liu, language, m sereno, novel, npr, podcast, poetry, reading, review, tagalog, uncanny. Bookmark the permalink.